Kingfisher, named after the kingfishers we see on the securely fenced moat from time to time has a porch which leads through a stable door to an open plan living/dining area with a dining table, 12 chairs, a high chair, comfortable sofas (one of which is a sofa bed) and a log burner for cold winter evenings. There is a large flat screen TV with freeview, DVD player and surround sound home cinema. There is a fully equipped kitchen with range cooker, microwave oven and washer/dryer plus a large American style fridge freezer for your convenience. There are two en-suite double bedrooms with zip and link beds on the ground floor and also a separate loo. Upstairs there are two super king sized beds and another spacious zip and link bedroom. These three bedrooms are easily large enough to add a zed bed if required which we do supply as well as a travel cot. 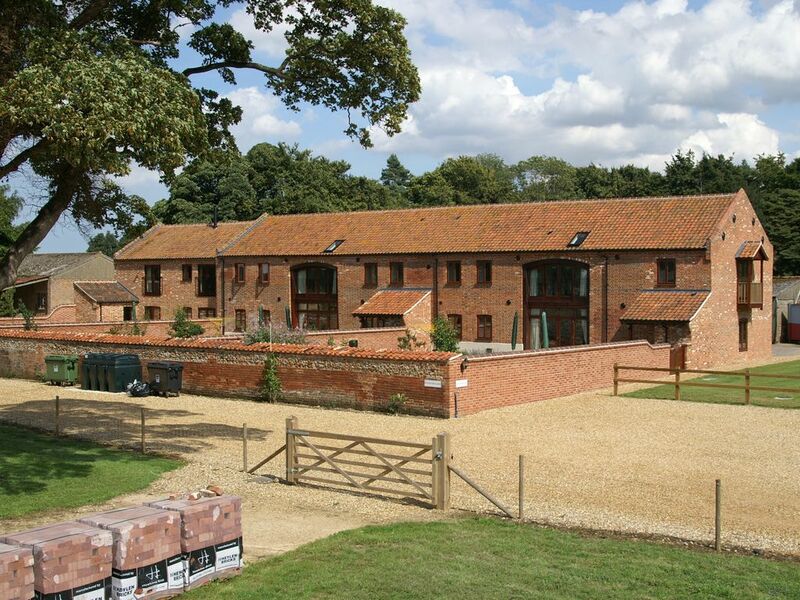 3 adjoining pet friendly barns have been sympathetically converted to provide spacious and comfortable accommodation. We provide free wifi, oil fired central heating, range cookers, enclosed and private walled gardens, private parking and built-in barbecues. There are no steps to get into the properties and some double en-suite rooms on the ground floors for those who may struggle with steps. We are happy for pet owners to walk their dogs on leads around the farm where there are great opportunities for bird watching. The barns are situated on the farm itself with views over open countryside and the lovely Sculthorpe Church on the driveway. I am Tony Pointer, farmer and now self catering accommodation owner aswell. After transfering the old grain barns and pig yards into my name in 2007, it has been my task to make these barns into the accommodation that our own family would be happy to stay in, and i think with my wifes help we have succeeded. I also enjoy meeting all those that stay in the barns and taking on their comments about the barns, which fill me with the confidence that we have got most things right(if not always the weather!). Having been born and brought up,and being the third generation on this family run farm, it was my ambition to convert these old barns which were starting to fall down. I felt that entertaining people instead of mucking out pigs was a better option for the future after going through the difficulties brought on by foot and mouth twice and swine flu outbreaks in the countryside. There are so many lovely things about the North Norfolk coast that i find it hard to tear myself away from this area, and i hope those that stay here will take home some life long memories. These barns are built so that each barn can contain each family seperately, but also if all barns are booked together the people staying can enjoy the group feeling, as we can hire out marquees and bouncy castles especially for the warm weather periods. There is ample parking space and a large grassed area at the end of the barn for all to play on. With your first fire set and ready to go. Additional wood suppplies are available locally. Long oak table and dining chairs for 12 guests. Quite the banquet. Notes on accommodation: All barns offer the option to use a sofa bed and/or a z bed ideal for younger children - this can easily be added to any of the larger rooms. Outside: All barns have an enclosed lawned walled garden with built in BBQs. Patio areas are equipped with garden table with parasol & chairs in the warmer months. A lovely property. Everything that you need for your stay. Our stay was perfect. From comfortable beds to sitting watching tv by the log burning stove. I would definitely recommend it. On the estate there are pathways which we recommend if guests wish to take walks. Booking Notes: Please contact owner. info@piggybackbarns.com Changeover Day: Please contact owner. Notes on prices: Check out availabity and prices on website.